featuring Derek and The Dominos. 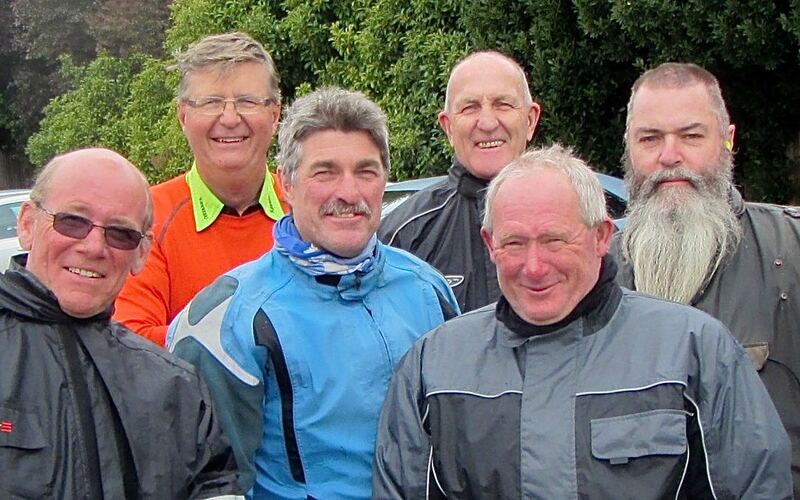 7 of us in total agreed to a bit of madness: Neil, Peter, Barry, Damian, Kennie, Jack and Greg. A good size, although a pity that Willo couldn’t make it (the excuse being a sore groin…ask no questions, and get told no lies). A lot of planning and discussion must have gone on (with Peter having a big say, by the looks of the chosen roads), because maps of a trip promising immense enjoyment was handed out at the induction. Click here for the map, and also for day 1, day 2, day 3, day 4, day 6, day 7, and day 8. Thanks to Lynne for her assistance. A gallery of photos is available here. Kennie found the gutter at Batemans Bay unreachable, and dropped his bike. Not to be outdone, Greg dropped his bike at the carpark at Phillip Island when he stalled it. 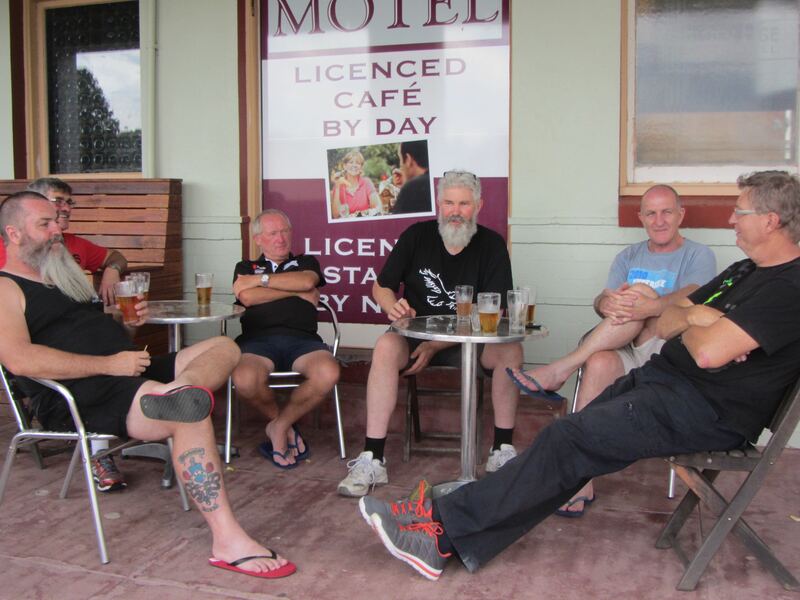 Neil took us to the Railway Hotel at Myrtleford…ooops, wrong hotel. Let’s put our gear back on and ride to the real Railway Hotel. The fastest lunchbox in the West. Hard earned drinks taste even better! Black and Silver were the colours of the day (bikes), although Barry’s high-vis panniers/boxtop (“like a circus tent”: Damian) could be seen from the horizon on a dark night. 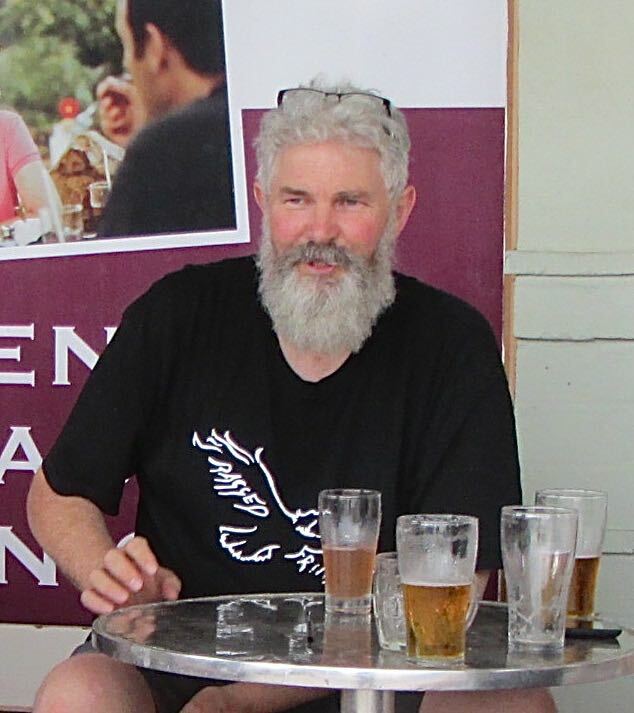 A nice looking blonde came up to us at Crookwell and described how she had had a great time the previous night with us — while looking straight at Peter. It was wonderful to see the improvement in Jack and Kennie’s speed on the bike, as the days progressed. Well, until Jack overcooked a corner on the ride back from Mt Beauty! His beard looks a little whiter now. Damian went walkabout, but his twin Derek appeared. Then Derek disappeared and Damian reappeared. But then, it happened again. And again. We all like Damian very much! 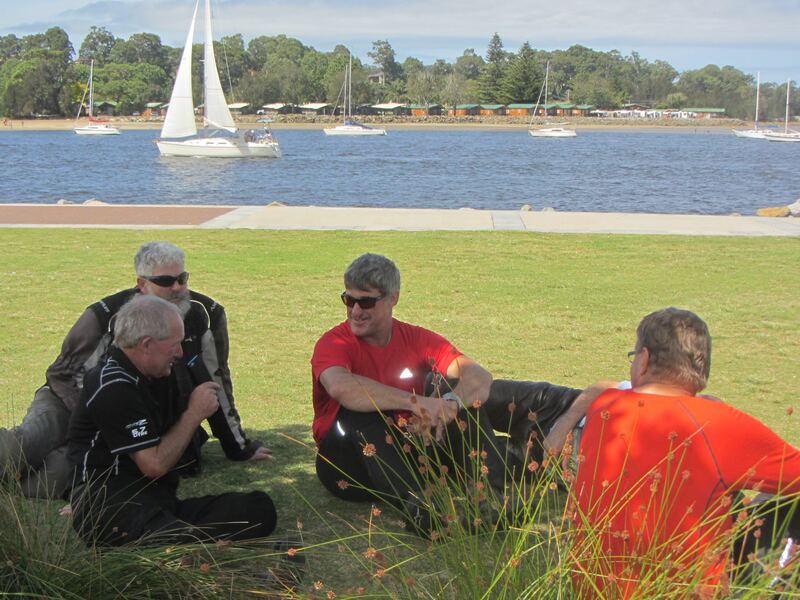 After Kennie showed he was a bit short on bike skills, we waited for Jack at Batemans Bay. And waited. And waited. Jack was later found with his mojo back at Mogo. Ah! Drinks at the end of the day after a hard ride never tasted so good! Neil’s Yamaha had excellent fuel consumption. Oh, except when out of fuel. Thanks Damian for returning with some fuel. Peter wore appropriate head scarf for the Australia Day weekend – a Eureka head covering. Damian did some massaging of Barry’s back and calves. The screams from Barry were ear-piercing. But it all worked out for the best. A bit of pain for a bit of gain. Kennie’s salt replacement therapy, of using sand on his food, at Kilcunda. The bends and bends and more bends, and even more bends, and yet even more bends. Did we have enough bends? Don’t go to Omeo if you want quality coffee. Someone said: “Zambookas all round” at Leongatha. It was a good night! Luckily my credit card has a high limit. It is also my excuse for the misadventures the next day: I dropped my bike in the carpark; my zipper became stuck in my ‘condom’; I forgot my hat and ended up sunburnt all over my face, head and lips. Teddy bears, teddy bears for Damian. Really great weather…with only a decent drop of rain occurring at Clyde Mountain. My mechanic (Taylors Motorcycles) was impressed with the wear on the edges of the tyres after only 4500km. All of the maps can be zoomed, as per google maps, The type of map can be altered to roads, terrain, etc. Day 1: Home to Batemans Bay, via Blayney, Frogmore, Crookwell, Goulburn, Clyde Mountain. Overnight accommodation was at The Coastal Comfort Motel. Day 2: Batemans Bay to Jindabyne, via Bombala, Monaro Highway, Cann River, Orbost, Bonang Highway, Delegate, Bombala, and Dalgety. Overnight accommodation was at the Alpine Resort Motel. Day 3: Jindabyne to Omeo, via Adaminaby, Elliot Way, Tumbarumba, Granya Gap, Tallangatta, Omeo Highway. Overnight accommodation was at the Golden Age Motel. Day 4: Omeo to Leongatha, via Bairnsdale, C106, Sale, Rosedale, Yarram. Overnight accommodation for days 4 and 5 was at the Leongatha Motel. 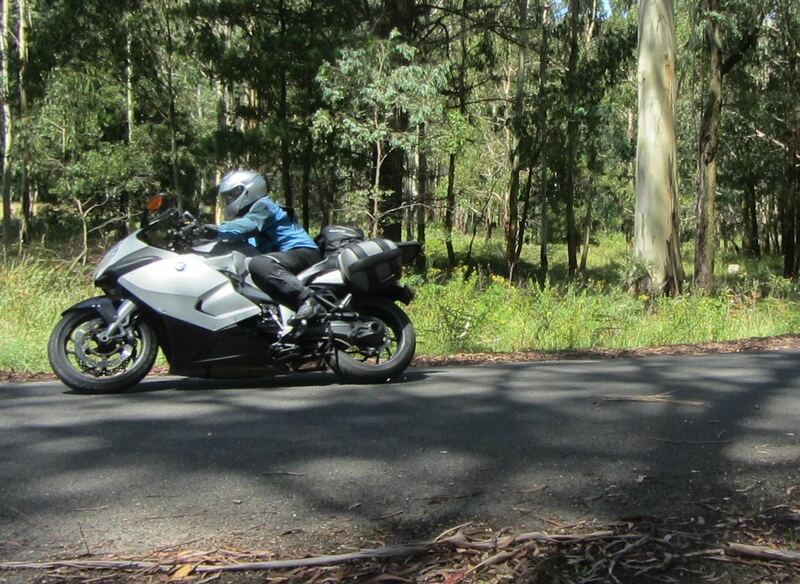 A typical pose – Peter out in front on his Beemer. Day 6: Leongatha to Myrtleford, via Warragul, Neerim Junction, Yarra Junction, Reefton Spur, Taggerty, Lake Eildon, Mansfield, Whitfield, Oxley. Overnight accommodation was at the Railway Hotel/Motel. Day 7:Myrtleford to Canberra (the rest of the Dominos went another way after Cooma – Tarthra? 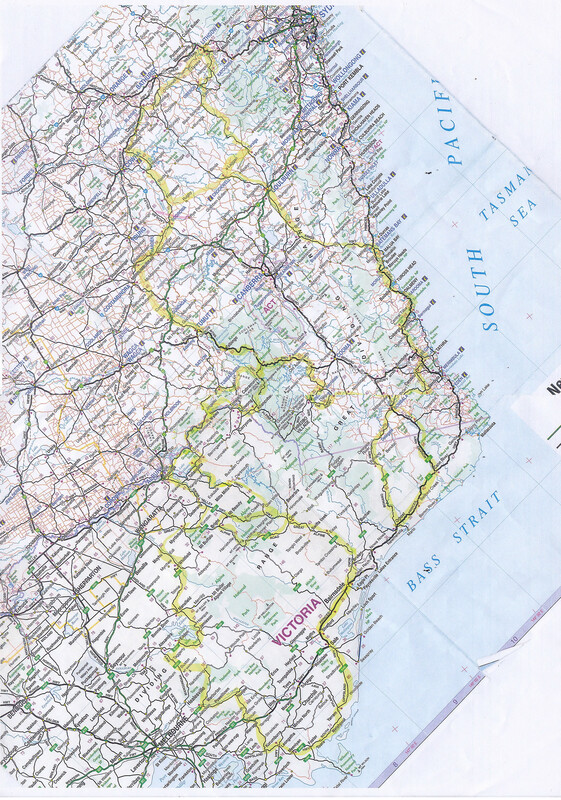 ), via Tawonga Gap, Mt Beauty, C537, C543, Corryong, Thredbo, Cooma. Accommodation was at the Aria Motel. A map of the entire trip is located here. Note this could take awhile to load. The days are highlighted in differing colours, and can be turned on/off.